After I watched the Make It Monday video I thought my Funky Florals would be the perfect stamps to use for this week's Make It Monday Challenge. So, I stamped the flowers in three different sizes in Melon Berry, Plum Pudding, and Hawaiian Shores. Then I embossed the centers with White Filigree Embossing Powder. 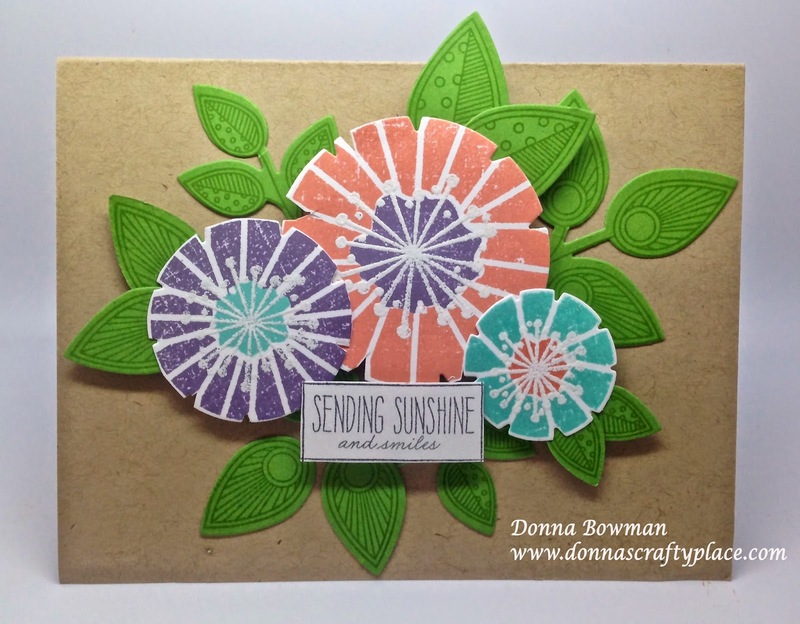 Then I stamped the middle of each flower with the second step for each stamps in another color. It turned out better than I thought it would. Anybody who knows me or follows me knows I don't do a lot of heat embossing. It's just not my thing. I always seem to get extra embossing where I don't want it and for some reason that makes me crazy!! But, these turned out OK. I also used New Leaf Paper and Doodlie-Do leaf dies to make the leaves. I stamped on the leaves with New Leaf ink. I enjoyed learning the tip on how to use the die on an image that is already stamped. I will definitely do that in the future and it worked great. I was lucky to have two step stamps and matching dies so I could do this technique without much trouble. I adhered all the pieces to a card base made from PTI Kraft paper and the sentiment is from the Doodlie-Do stamp set. Thanks for stopping by! This card is so striking I love that you did it on craft cs it really makes the flowers pop and I love the sentiment as well!! Absolutely gorgeous Donna, such a pretty collection of colour! Very pretty, lovely use of the stamp sets. Love what you did with the images! The white emboss on the top is awesome! A really beautiful card! this turned out so so good!!! you really got this make it monday challenge! youre right, you never heat emboss, but i hope you start it up more!